Digital Embracing deals with constant metamorphoses and transformation by studying the relationship between computer art and the use of the hand, microcosm and macrocosm, fragments and unity (the whole), figuration and abstraction. What appears simple is in fact complex and multi-layered. Join us for free lecture with art history professor Anna Tahinci, as she uses Jungian psychology to examine Reis’ series of paintings, Thursday, December 8, 7-8 pm. 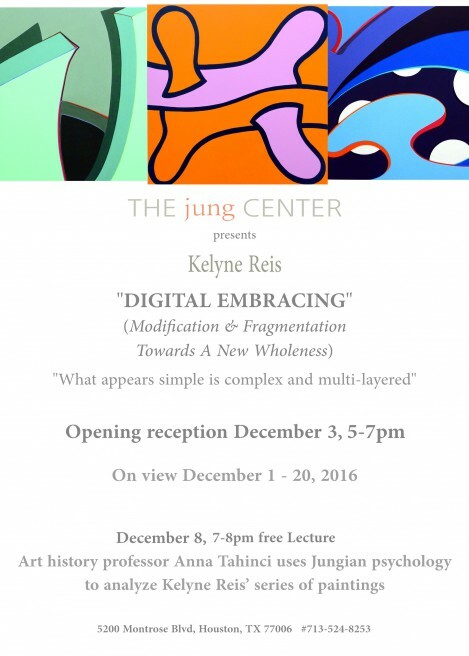 Join us for a richly illustrated lecture with art history professor Anna Tahinci, as she uses Jungian psychology to examine well-known Houston artist Kelyne Reis’ series of paintings, Digital Embracing (on view at The Jung Center December 1-20). The fundamental image of Reis’ series – the fingers of two hands uniting in an embrace – will be analyzed as an archetypal image. Through digital modification and by hand, Reis zooms in and out on this singular image, creating visual puzzles that encourage viewers to move across a continuum of perspectives. Dr. Tahinci will describe how Reis’ process and the resulting series of paintings can be used as tools to help viewers examine both the personal and collective unconscious. A book showcasing the series and including an essay written by Dr. Anna Tahinci will be available. Dr. Anna Tahinci is professor and head of art history at the Glassell School of Art. She has worked at the Musée Rodin, the Musée d’Orsay, the Harvard Art Museums, and the Louvre. She studied history and archaeology in Greece, museum studies at the Ecole du Louvre, and comparative literature and art history at the Sorbonne. She received her PhD from the Sorbonne with a specialization in nineteenth and twentieth century French sculpture. Dr. Tahinci has taught at Boston University–Paris, the University of Minnesota, Macalester College, the Minneapolis College of Art and Design, and the University of Houston. She co-curated the sculpture exhibition for the Athens Olympic Games in 2004 and the exhibition Rodin and America at the Cantor Arts Center, Stanford University in 2011.